"A delightful read. Hats off to author and presidential historian Feather Schwartz Foster!" -Karen L. Schnitzspahn, author of Remarkable Women of the New Jersey Shore and other books. "A delightful read. Fashion has always made a statement and the first ladies' clothing reflects not only their tastes but the times they lived in. These short stories featuring specific items such as a hat or an apron, gowns or jewelry, are both amusing and enlightening. Hats off to author and presidential historian Feather Schwartz Foster!" ­ -Karen L. Schnitzspahn, author of Remarkable Women of the New Jersey Shore and other books. ...Did Mary Lincoln really wear flannel pajamas? ...Why was Martha Washington's "dress" turned into a pincushion? ...How did Julia Grant's hat show support for the Confederacy? ...Did Edith Wilson really track mud onto the White House carpets? These are some of the stories (all true) that have been told about some of the First Ladies you may have forgotten about - or never knew. The stories are either factual, actual or "metaphorical" using an item of their clothing to propel the tale. "There are few contemporary chroniclers of America's first ladies more adept than Feather Schwartz Foster. Her ability to penetrate the obvious and predictable has made for some endearing and revealing profiles. 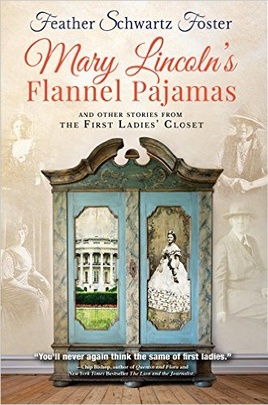 How comes her latest, Mary Lincoln's Flannel Pajamas and other stories from the First Ladies' Closet, which takes the reader deep into the persona of the women who shared their husbands (and others) with history. It's a warm and insightful look behind the scenes. You'll never again think the same of first ladies." -Chip Bishop, author of Quentin and Flora and New York Times Bestseller The Lion and the Journalist.